Paxi belong to the Ionian island complex, located in the northern part, a few miles before Corfu and just a short ferry trip away. Although the majority of the Heptanese islands are world-famous for their incomparable beaches and breathtaking surroundings, Paxi are less known – however equally beautiful and definitely worthy of your attention. So what about making a different choice this year? The capital of Paxi, Gaios, seems to have emerged from another era; the superbly picturesque small harbor has two different small islands that resemble a Norwegian fiord, full of small boats and larger yachts that stop by frequently. Walk within the small backstreets (“kantounia” as the locals call them) and admire the architecture which has been heavily influenced by the Venetians. On the small island of Agios Nikolaos you can also find the Venetian Castle that even features designs by Leonardo Da Vinci! Do not also forget to visit the beautiful Loggos, just under 6 kilometers from Gaios – a picturesque fishing village that has preserved its traditional character. Paxi are also known since antiquity for their healing springs that attract not only visitors who suffer from rheumatic issues, but also those who want to benefit while relaxing. 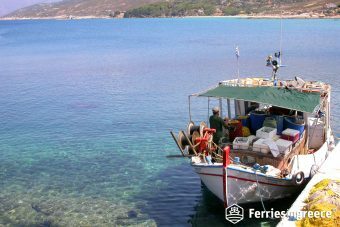 Finally, you can visit the island of Antipaxi by small ferries –it is less crowded and ideal for a relaxing stroll by the sea. Paxi will leave you amazed with their jaw-dropping landscapes and beaches. 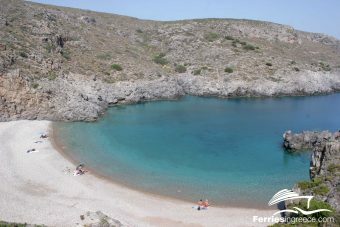 Voutoumi at Antipaxi is a small paradise, regarded as one of the most beautiful beaches in Greece; it is a small bay with bright blue, transparent crystal waters, surrounded by the orgastic green nature. Vrika beach is a wonder to the eye, and you can enjoy the amazing view while eating in one of the restaurants upon location. Erimitis is roughly translated in greek as “loner”; indeed the shore is of wild beauty, a unique instance of scenic environment. Last but not least, make the extra effort to visit the Tripito Arch, a real natural wonder. You can reach it by following the path that begins from Ozia village and if you are patient enough, you will be rewarded by the spectacular view of the Ionian sea, over a rock that has been shaped by the natural forces into a bridge –photographs are a must! Paxi’s cuisine is typical of an Heptanese island; loads of fresh fish and premium quality seafood, amazing olive oil and wine (Antipaxi produce the unique variety of black wine) compose a gastronomic heaven. Many traditional dishes are identical to those of Corfu, however do not miss the chance of trying a special kind of meat pie called “tsiligourdopita”. The honey produced is also excellent.